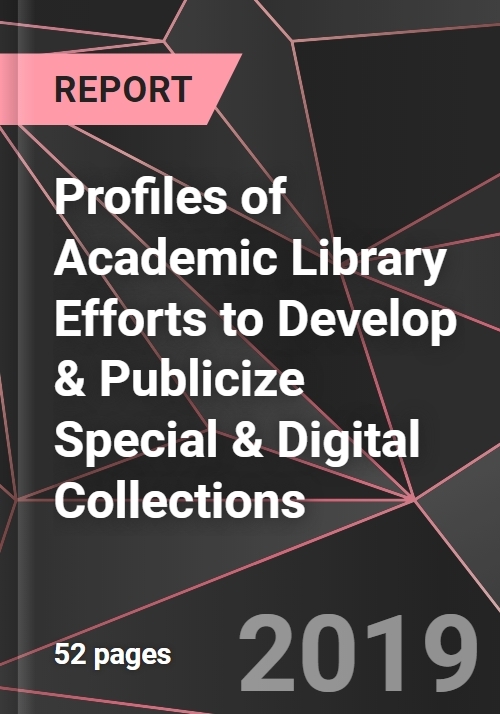 This engaging report profiles the efforts of five higher education institutions of different types and dimensions - George Mason University, the University of South Florida, Pennsylvania State University, Pacific Lutheran University, and the University of Central Florida – to develop and especially to publicize and market their special and digital collections. Among the issues covered are: assessing the needs of primary end users such as student, faculty and researchers; transitioning from an acquisitions-based to a services-based approach to collection development; digital archive creation; treatment of born-digital materials; the incorporation of special collections into open access strategies and general coursework; and cataloging, findability, email promotion and social media strategies. The author also explores the growing use for special and digital collections of institutional digital repositories. Other issues of note discussed include the use of 3D mapping, use of emerging technology platforms and tools such as SiteImprove, BitCurator, ArchivesGrid, Aeon, SketchFab and others, as well as strategies for developing key partnerships and collaborations both within and outside academic institutions, and much more of interest to anyone involved in developing and marketing library special and digital collections. The study’s author is Skye Rodgers. Skye has a BA in sociology from the University of Alberta and a master’s degree in mass communication from the University of South Florida. Prior forming her own communications consultancy – Skye Writer Communications Inc. – she was Director of Communication, Learning Services Portfolio (includes Libraries), 2008 – 2010, for the University of Alberta and Assistant Director of Libraries for Communications, University of South Florida, 2003 – 2007.